If you recently unlocked your iPhone 4 and tried to run it on a T-Mobile US SIM, you must have noticed that MMS doesn’t work anymore. Well good news is that there is now a fix available in Cydia which will fix this problem once and for all. Simply follow the instructions posted below to fix MMS issue on unlocked iPhones on T-Mobile US running on iOS 4.0.1 / 4.0. NOTE: You will need to have a jailbroken iPhone to get it to work. Follow the step by step guide posted here to jailbreak your iPhone 4, 3GS and 3G on iOS 4.0.1. Instructions for unlocking iPhone 4 can be found here, and for iPhone 3GS and 3G can be found here. Step 2: Now touch on “Edit” and then on “Add”. You will be prompted to enter a url source as seen in the screenshot below. Type “http://cydia.pushfix.info” and touch on“Add Source” to add this repo if you haven’t already. Step 3: After installation is completed. 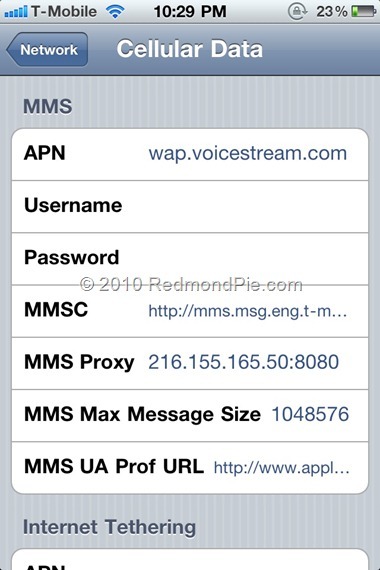 Search for “T-Mobile US MMS Fix for iOS4” in Cydia and install this application. Step 5: Now simply restart your iPhone and voila! MMS should now be working on your jailbroken and unlocked iPhone on T-Mobile US. Worked like a charm! Thanks!!!!! This should enable the Cellular Data button on your Regular Settings. Good luck! I just installed this patch on my iphone 3G running under iOS 3.0 and its working now. I can now receive MMS messages. I would like to know if downgrade to 3.1.3 and it will work for data plan on iphone 3gs? This worked like a charm!!! Spent many hours searching online and trying different settings, I also called t-mobile and nothing but this did it THANK YOU SO MUCH!!! I have a 3GS on 4.0.1 and sends and receives pictures PERFECT! Thanks for sharing your knowledge. Worked for me! I too, have called T-Mobile and they were not able to help me. I try it the first time i brought the phone it didn’t work… when I went to the network so I can put the setting I couldn’t found the page to enter the code after a few week it just show off on it’s on I just put the code and everything is working fine now.. some time you need to be patient to beat the technology…. thanks for your help very helpful………….